What is the SALAAMATI PROJECT? The SALAAMATI PROJECT is motivated by our Christian belief that God loves each and every person, that he longs for fullness of life for everyone, and that he calls his church to the compassionate service of all, especially those most in need, irrespective of human divisions of any kind, including those of language, ethnicity, culture religion. The SALAAMATI PROJECT intends to work in partnership with statutory, community and voluntary agencies in the locality to provide services which complement and enhance those already available to people in Southall. 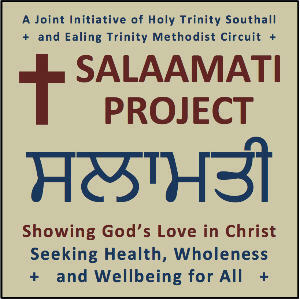 The SALAAMATI PROJECT is a joint initiative of Holy Trinity Church Southall (where the project is based) and Ealing Trinity Circuit of the Methodist Church.